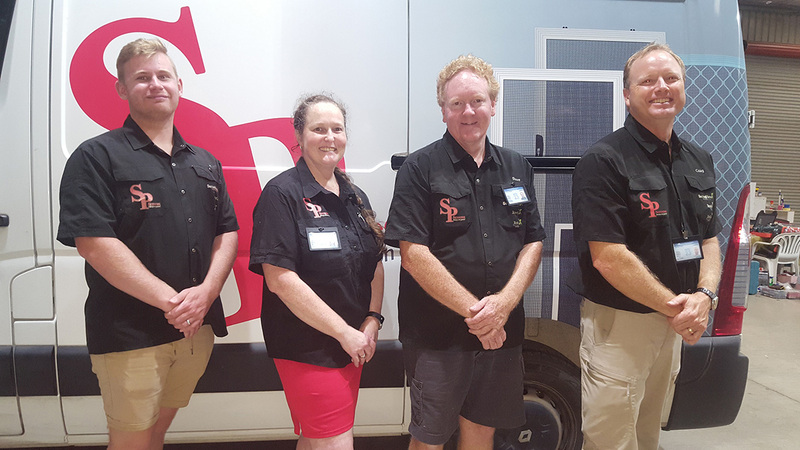 Formally operating as Mobile Security Doors Coffs Harbour, SP Screens has been a local family owned business and employer here on the Coffs Coast for over 25 years. All our installation team are fully accredited professionals – not only skilled tradesmen, but we also all hold security licences as required by state law for installation of security screens. We pride ourselves on providing reliable and superior service and workmanship. As every door and window opening is unique, the screens we manufacture are custom made to your exact measurements. We help you with your colour choice as well, providing a style to suit your home or business. Domestically designed, our security screens are built from 316 Marine Grade stainless steel, and have been tested and proven to be able to withstand a wide variety of forced entry methods. Their small hole aperture means they do double duty, keeping all but the tiniest of flying insects at bay. If you’re looking to keep the coastal breeze flowing through your home, without compromising on safety, security screens, windows and doors from SP Screens can make it happen. Our security doors have been created to offer a strong barrier to entry, resistant to a huge range of blunt force attempts, jemmying, blades, and more. The strong stainless steel mesh is tightly woven enough, meanwhile, to function as an effective insect screen. Available in a variety of colours, we make sure that our security doors suit your Coffs Harbour home. SP Screens’ lineup of Fallsafe screens provides both an effective barrier to entry, and a guard against accidental falls from upstairs windows. Your standard flyscreen will easily tear under stress; ours easily meet BCA requirements, and will lessen the risk of falls from high windows without impeding the view or airflow. Retractable flyscreens give you the option to screen off larger openings in your home, such as Bifold doors. With these screens, you can open your home to the ambiance and fresh air of the outdoors, while maintaining a fly-free atmosphere indoors. If you are looking to improve upon the privacy and serenity of your property, a privacy screens could suit you nicely. Screening off an area from public view extends a sense of privacy on your property, while discouraging opportunistic theft. Built from aluminium, they won’t rust in the salty air. Providing shade on those hot afternoons can make the difference between a stifling indoor home, and one that is a joy to come home to. Custom-built, our shutters are colour-matched to your décor. Roller blinds provide more than a sunshade – they also protect against poor weather such as wind or rain. Living in an enviable climate, Coffs Harbour locals enjoy outdoor living from home patios, verandahs, decks and back yards. Roller Blinds allow outdoor areas to be enjoyed even when the weather is poor. Quickly and easily stored away, they are there when you need them. Choose a day and time convenient to you for an in-home consultation (includes expert advice and quote).